Murray powered to his first victory over Federer in an ATP Tour final. 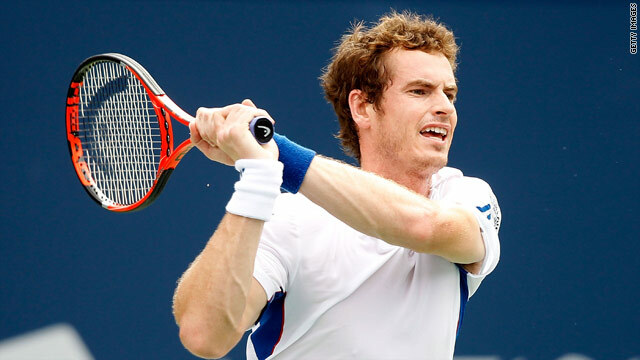 (CNN) -- Andy Murray successfully defended his Masters 1000 crown in Toronto with a straight sets 7-5 7-5 victory over Roger Federer in Sunday's rain-interrupted final. It was a timely return to his very best form for the Scot, who was winning his first tournament of 2010 heading into the U.S. Open, the final grand slam of the season. He is the first man since Andre Agassi in 1995 to win back to back titles in the prestigious Canadian hard court tournament. "It's so tough closing out a match against Roger," Murray told Sky Sports. "It was incredibly difficult conditions for both of us." Murray lost to Federer in the Australian Open, handing the Swiss his 16th grand slam crown, but both men have slipped down the rankings after relatively disappointing seasons. Federer climbed his way back to world number two after beating Novak Djokovic in an epic semifinal, but could not reproduce that form in a match hit by no less than five rain delays. Murray continued where he had left off in beating world number one Rafael Nadal in their last four clash and quickly gained two early breaks on the Federer service. But Federer quickly gained one back and when Murray served for the set at 5-4 took advantage of sloppy play by the fourth seed to level. Murray was not be be denied and duly achieved his third break of the set, helped by a clever lob to set up break point, and served it out to take the lead. At 2-1 to Federer in the second set, persistent drizzle forced the players off and on the return it was the British star who gained an early advantage by again breaking Federer, only for more rain to break the rhythm of the match. Between three more rain breaks, Federer broke back to level at 3-3 and the match went with service until the 11th game when rousing play by Murray left him to serve out for the championship. Federer fought back again to force a break point, but Murray saved it with an ace and closed out victory on his second match point.